United Futbol Academy is one of the largest clubs in Georgia, United States, and lives by the motto, “Skills for soccer, skills for life.” Like One World Play Project, we believe play and soccer can transform lives. We believe the true value of success in soccer lies in the overall development of the individual player’s soccer skills — technical, tactical, physical and psychological — as opposed to the result of each game. Our goal is to share our strength with the world by providing a platform for United Futbol Academy to give One World Futbols. The One World Futbol never needs a pump and never goes flat, allowing children to play on without worrying about finding a pump or breaking the ball. This unique ball will enable children who receive it to continue playing for years. 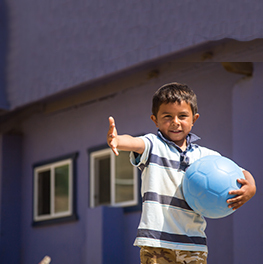 The ultra-durable One World Futbol allows children to be children. For more on United Futbol Academy, visit unitedfa.org. Through this campaign, United Futbol Academy raised seven One World Futbols.